People turned to BBB more than 165 million times for BBB Business Reviews on more than 4.7 million businesses and Charity Reports on 11,000 charities. 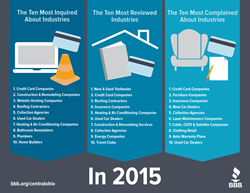 Wondering what some of the top companies that consumers were looking for in 2015 were? The results are in. Consumers continued to trust and use the various resources offered by Better Business Bureau® serving Central Ohio (BBB) with more than 1.9 million requests for business reports on Central Ohio companies in 2015. BBB also processed more than 8,000 complaints locally and received over 3,000 customer reviews. BBB began publishing customer reviews in 2013 and to date consumers have submitted over 8,500 customer reviews impacting BBBs overall service to the community. At year-end over 5,300 Accredited Businesses were committed to BBB’s high standards of trust and the resolution of marketplace disputes through conciliation, including arbitration, if needed. This represents a very positive commitment by BBB Accredited firms to stand behind their products and services, and to ensure proper resolution of any disputes that may arise. To help consumers make savvy marketplace decisions, BBB names the top ten most complained, inquired and reviewed industries of 2015. For more information on finding businesses you can trust, check us out on Facebook and Twitter. For more than 100 years, Better Business Bureau has been helping people find businesses, brands and charities they can trust. People turned to BBB more than 165 million times for BBB Business Reviews on more than 4.7 million businesses and Charity Reports on 11,000 charities, all available for free at bbb.org. BBB Serving Central Ohio was founded in 1921 and serving 21 counties in Ohio, is one of 113 local, independent BBBs in the United States, Canada and Mexico.